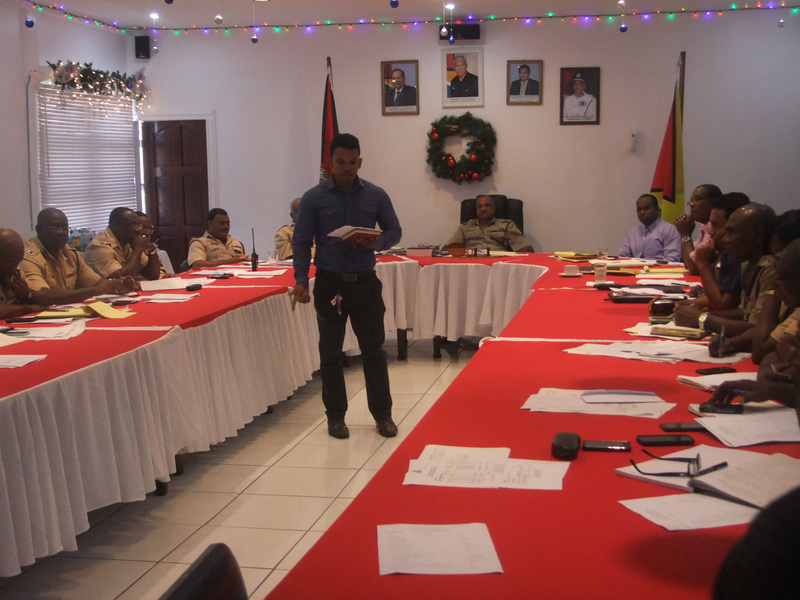 Yesterday, senior officers of the Police Force’s Administrative Performance Group benefitted from a presentation on ‘Men’s Health’ which was given by Dr. Dennis Bassier, Men’s Health Coordinator of the Ministry of Public Health. In this police photo Dr. Dennis Bassier speaks to members of the Administrative Performance Group. A release from the police said that Bassier was accompanied by Dr. Zulfikar Bux, EMS Medical Director at the GPHC. The presentation was made during a meeting of the Performance Group in the Commissioner’s Conference Room, Police Headquarters. The release said that this was in keeping with the Police Force’s thrust to enhance the well-being and physical fitness of members of the Force. Stemming from the ensuing discussions, points of contact were established between the Police Force and the Ministry with the view to having sustainable medical services and preventative health care being available to ranks. It is planned to have periodical medical outreaches and men’s health forums within the policing divisions to raise awareness and educate ranks, the release said.